The Mile High city is home to more apartment complexes than ever before. If you’re new to Colorado, welcome! One problem that many citizens do not anticipate comes in the form of small, flat insects that feed on their blood while they sleep. Yes, bed bugs are gross, and yes, they have been known to spread across multi-family living spaces. If you’re in need of professional bed bug detection services in Denver, the team at Advanced K9 Bed Bug Seekers is here and ready to help! 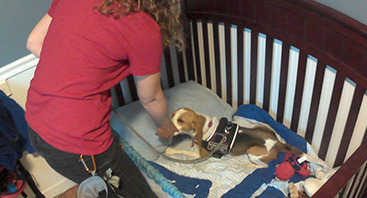 Our experienced team and top-trained dog, Tracker, will provide complete bed bug inspections to ensure your home is free of this troublesome pest. If you’re worried about bed bugs this winter, it can help to take a few steps to minimize the chances of an infestation. Read on to learn about a few of our tips, and be sure to call us if you’re worried about your residence! Donation centers have made the process of buying used furniture both economical and affordable. However, this method of furniture acquisition holds a high potential for bed bug problems. Before you buy that used couch, be sure to inspect it for any signs of bed bug infestations, including reddish stains, dark spots, or tiny eggshells. Bed bugs can flourish in clean environments, but it can help to know that they prefer to hide in cluttered environments. We recommend reducing the amount of stuff laying around your place to reduce the number of hiding spots. 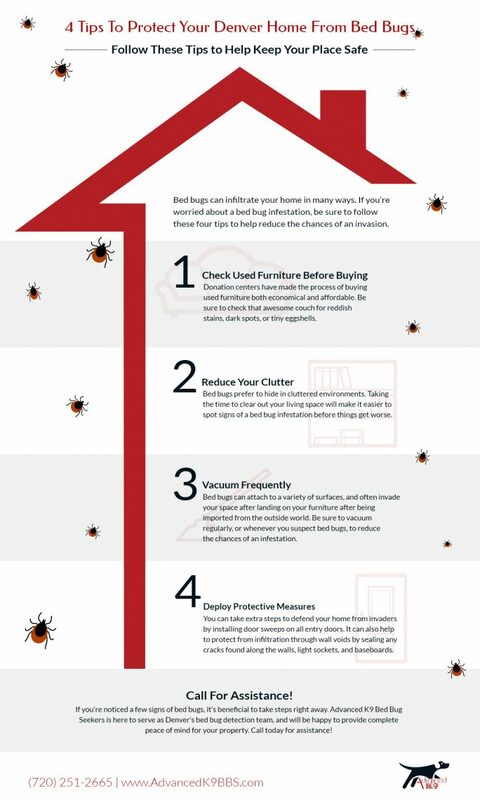 Not only will this help you feel better about the state of your home, it will also make it easier to spot signs of a bed bug infestation before things get worse! While keeping a clean home can provide your family with a plethora of positive benefits, when it comes to bed bug prevention, vacuuming can help to stop hitchhikers from making the jump to your furniture. Bed bugs can attach to a variety of surfaces, and often make their beachhead after landing on your furniture once they’ve been imported from the outside world. Living in a multi-unit complex can lead to a lot of stress when it comes to bed bug infestations. If you’re in an apartment and are concerned about invasions, it can help to install protective elements to prevent unwanted guests from moving in. Door sweeps along the bottom of your entry doors, for example, can do much to stop bed bugs from sneaking through. If your place has numerous cracks along the walls, light sockets, or baseboards, we recommend using a sealant to stop infestations from your wall voids. If you’ve noticed a few signs of bed bugs, it can help to reach out to our professional team right away. 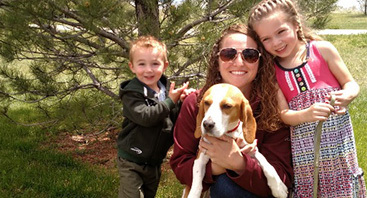 Advanced K9 Bed Bug Seekers is here to serve as Denver’s bed bug detection team, and with the help of our dog Tracker, we’ll be able to provide comprehensive inspections to ensure your place is free from pesky intruders. Contact us today to learn more!